One of the best units I ever taught was a reading workshop on the theme of WWII. Students had to read at least five books about this time period, which gave them a broader knowledge base than just reading one class novel. Some of the most popular books included The Boy in the Striped Pajamas, Numberthe Stars, The Devil’s Arithmetic, and Art Spiegelman’s Maus series. Although the Maus books are challenging, my developing readers devoured them and learned so much. 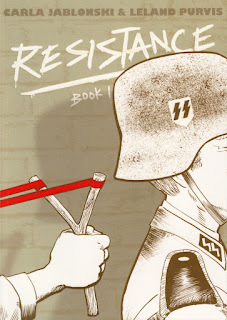 Resistance, the first volume in a collaboration between Carla Jablonski and Leland Purvis, would be another graphic novel I would recommend to these readers. Set in the unoccupied French countryside, Paul’s family runs a vineyard and is great friends with the Levys, a Jewish family who runs the hotel next door. When the Levy parents disappear, everyone is concerned about what happened to them, especially their son Henri, who was playing in the woods at the time. Paul and his younger sister Marie decide to hide Henri, which leads them to meet members of the resistance and get sent on a dangerous mission. Resistance has a cover that will grab readers. Purvis’ illustrations emphasize the tension of the era. His rough lines and expressive faces suit the circumstances. In addition to his own illustrations, Pruvis creates Paul’s sketchbook, which he uses to express the character’s true feelings in a time when putting on a mask is essential. The reader gets basic information about the Holocaust, but the horrific details are not included. For this reason, it would be a gentle introduction to the subject, or a welcome accompaniment to a unit.